Children need us. Extended family and friends require our attention and time. The Church, our community, our team…we are wanted. It is easy to give and give, and sadly our spouse is left behind and relegated down the ladder of attachments. Not good. Let's talk about putting your spouse first and create right ordered attachment in your home. 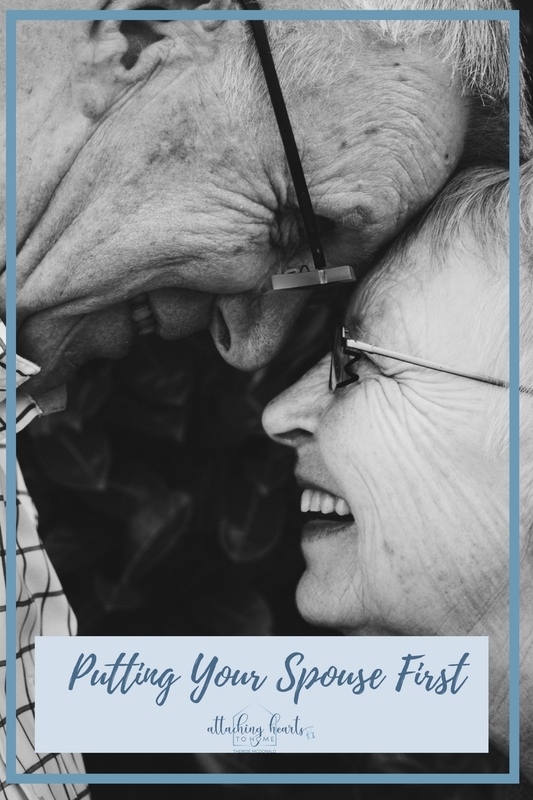 After all, we all desire to grow old with our spouse and create a full life together with an enduring love. It often happens little by little, over time, and unintentionally. Attachment is eroded and our beloved ends up taking a back seat in matrimonial life. Life can easily become complicated, conflict escalates, addictions kill relationship, financial needs – so much can get in the way of your love bond. It is a mistake and it is wrong to accept this condition. Many vows include the line “forsaking all others”. We are called by God Almighty to put our spouse first. Don’t put your marriage on hold. Note: Our children need Mom and Dad to love each other before them. When we do this, we truly love our children in a grander and more beautiful way, and our children in return find well-anchored security and sense of well-being. Attachment for the whole family blooms in this environment. 1. Don’t “find” the time for your marriage, make time. Be intentional about pursuing your spouse. Have a time for private talk every day. Accustom your children that this is undisturbed time. Teach your children to wait their turn. Even 15 minutes – make time. Shut down screen time and other distractions so you have time in the evening together. Little get-aways are nice – even a coffee out while Grandma watches the kids, or an older child minds your clan while you get groceries together. Make it happen. Make time for each other. If you don’t make time for your spouse, you’ll spend that time doing something less important. Deepening attachment must be a priority. 2. Make sure you are not just parents – you are partners first. Your relationship and identity is uniquely designed by God. Live your covenant/Sacrament first. Your life together is a courtship until death do you part. How are you wooing each other? Flowers, notes, time, walks, a movie, a living room dance… Be the twosome you are. Hold hands, kiss, compliment each other, and stay intimate. If there are barriers to this, get to the root. Address why your heart has hardened or is protected. Do not let distance become the norm. Attachment happens small moment by small moment- return to times of “sharing a moment” together. 4. Be attentive to each other. Send the message out, by your behaviour, that your spouse comes first. Answer their call. Covet their opinion. Be respectful in your language to one another. 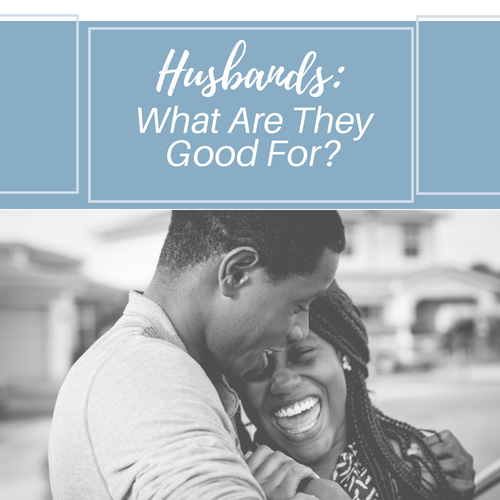 Show compassion, understanding, and interest for and in your spouse. Be ready to respond. If you’ve gotten into the habit of disregarding your spouse when they speak, give them a voice again. Be ready to serve your love. Keep them in your gaze and your presence. Be devoted. 5. Lastly, but not most importantly, pray for your spouse first; yes, before anybody else in the day. All this takes effort and practice, but remember, actions can become habits, and habits can become virtue. Love is action. The love bond takes intentionality to maintain and grow. We create attachment with who we pray to and who we pray for. If you find yourself “stuck” in your relationship, I can help you re-set your marriage. God desires your happiness and He gives us means for restoring all things. Take a step towards your spouse right now. What is one thing you can do right now to show kindness and intention towards your spouse? 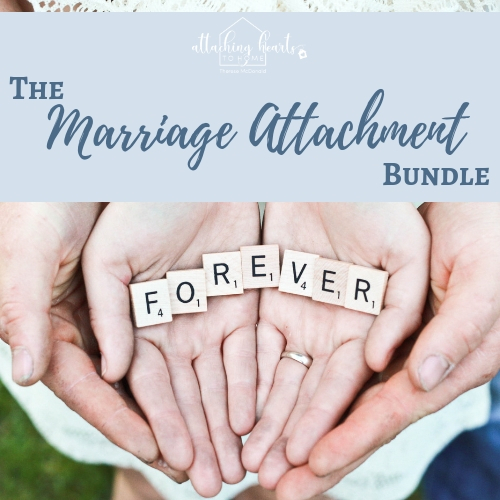 Looking for some practical ways to connect and ignite deeper connection and attachment in your marriage. Download this free marriage guide for a stronger marriage.